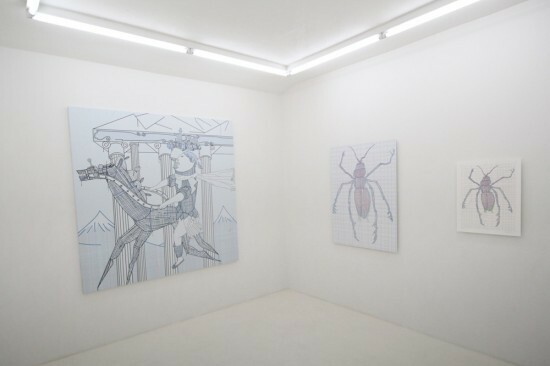 All images: Installation view of ” New Eidos” (2010) at Recto Verso Gallery, Tokyo. Inside a cube-shaped exhibition space so small two or three people would probably fill it, three of the four walls are taken up with relatively large pictures, one on each wall. 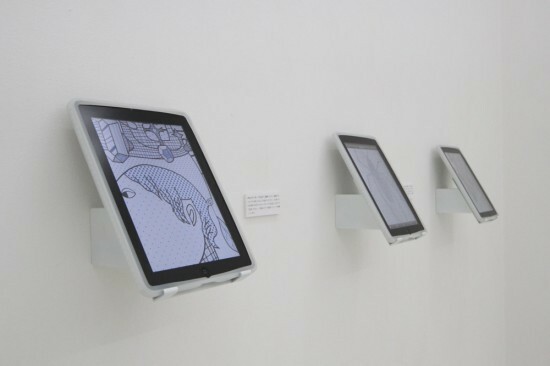 Against the remaining wall are placed three iPads, each of which displays one of the pictures occupying the remaining three walls. Visitors are able to pick up the iPads and enlarge the pictures to look at them in detail. But why iPads and pictures on walls? Although subdued, the exhibition leaves one with a mysterious sensation. Born as a result of all these twists and turns, “New Eidos” is – as the name suggests – founded on the dualism of eidos (form) and hyle (matter) as formulated by Aristotle on the basis of Plato’s original theory of ideas. In short, whether presented on a computer screen or output onto paper, film and so on, at the root of every “manifestation” (hyle) observable in the material world there exists an invisible “archetype” (eidos) that governs it. So how can we actually “view” the eidos of these new pictures that in the case of computers lurks in the background in the form of digital data? In a sense this is the purpose of Tsuzuki’s exhibition. In terms of the history of contemporary art, in his work One and Three Chairs (1965) Joseph Kosuth displayed alongside each other an actual chair, a photograph of this chair and a dictionary definition of the word “chair,” respectively, presenting three qualitatively different “manifestations” (hyle) of the same chair and in the process “exhibiting” the “unchanging, single chair” (eidos) that lurks in the background. In Tsuzuki’s case, by creating pictures using a computer, one could say he is re-presenting Kosuth’s experiment in a different form. The artist himself usually works as an illustrator, and in this sense the premise that lies behind this exhibition clearly has an art historical dimension. 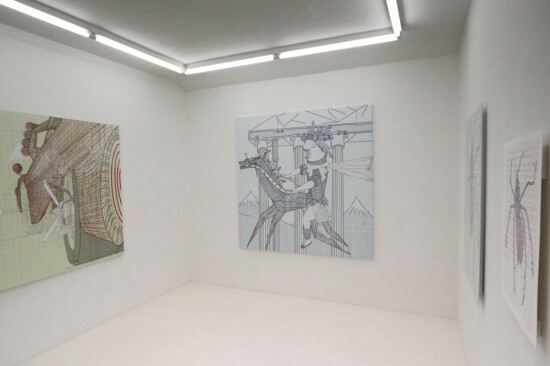 Or perhaps on the contrary, one should say that it is precisely because Tsuzuki is not involved in the world of fine art but is an illustrator who routinely prepares and submits work as digital data that he became conscious of this important problem. Incidentally, in the West there is a close relationship between places like art museums and other institutions and churches. In order to see important artworks, one is as likely or even more likely to have to set foot inside churches than art museums. When we “view” pictures in churches, the experience differs greatly depending on whether the works are painted on walls on a scale that threatens to engulf us or painted the size of books allowing us to peer into them. The former require effort on the part of not only the eyes but the entire body, while the latter demand to be viewed in such a way that we stare fixedly with the eyes stationary and without moving the body. To put it plainly, one is “embodied” while the other is “witnessed.” In fact, I think it may have been from this difference in ways of viewing that the fundamental difference between painting and drawing emerged. It is certainly not simply a case of painting being the application of color and drawing being the drawing of lines. By this I mean that, as Tsuzuki himself alludes to, the fact that pictures drawn by hand are freer than computer graphics bound by digital tools comes down to the fact that in the real world, to the extent that there are no lines to which some color has not been applied and colors that extend endlessly without an outline are an impossibility, in terms of both drawing and viewing pictures, both lines and colors are subject to all manner of change. In the real world, we can both see lines as color and see color as lines. The more closely we examine it, the harder it is to distinguish between painting and drawing based solely on the drawing of lines and the application of color. 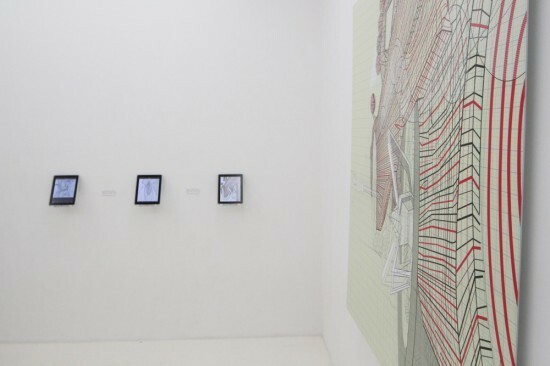 At this exhibition, however, because each of the drawn pictures is backed by digital data representing an eidos, the transformation of whose “manifestation” is freely manipulable, one is able to appreciate the works in defiance of such human physiological or physical characteristics. While the pictures that occupy the walls on three sides of the room are perceived physically as paintings and the screens on the iPads are clearly the size of drawings (books), the latter can be enlarged at will by manipulating the digital magnification. When so enlarged, although the screens remain the size of drawings small enough to fit in the palm of the hand, the analogical reference to the pictures on the walls gives rise to the sensation that one is viewing not something the size of a book but viewing as a painting a part of one of the large pictures on the walls. One could say that by rendering possible the coexistence and transformation of drawing and painting on the basis of neither a Platonic understanding of lines, colors and so on, nor the physical distance between picture and body, but rather properties ubiquitous to all manner of “manifestations,” this exhibition is poised to open up a new dimension in the pictorial art world. Jun Tsuzuki’s ‘New Eidos’ was on display at Recto Verso Gallery, Tokyo, from October 18-30. Even in the case of a book-sized picture comprising painted color surfaces, for example, it is probably an empirical fact that the picture on its own demands to be viewed from a certain distance. Incidentally, to the extent that one is unable to achieve a suitable body position while either viewing it at a distance or scrutinizing it up close, and consisting – in frank terms – solely of painted color surfaces, Color Field painting is more formative than materialistic, and therefore closer to the work of Kosuth in which the emphasis is on the idea behind the matter (and in which a particular way of viewing the work is done away with).